This is one of those instances where you may not hear me say “Don’t worry, we’ll just get another piece of wood and fix it.” Some operations are just high-risk, and this is one. 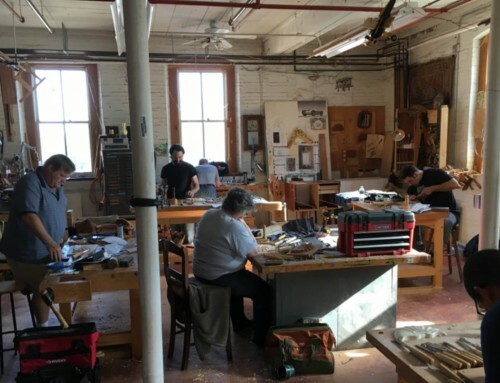 Many Rhode Island chests have a curved pediment molding that merges with a turned bit of molding that frames the pediment cutout. 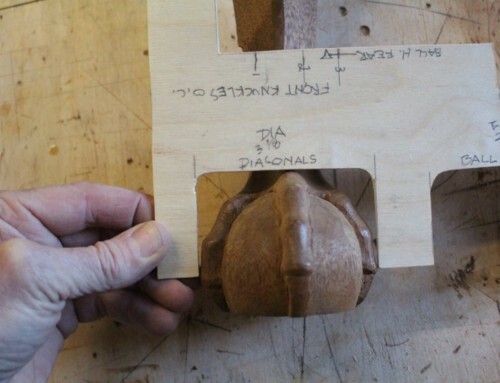 The joint is essentially a mitre, but a long curved one that’s difficult to cut. 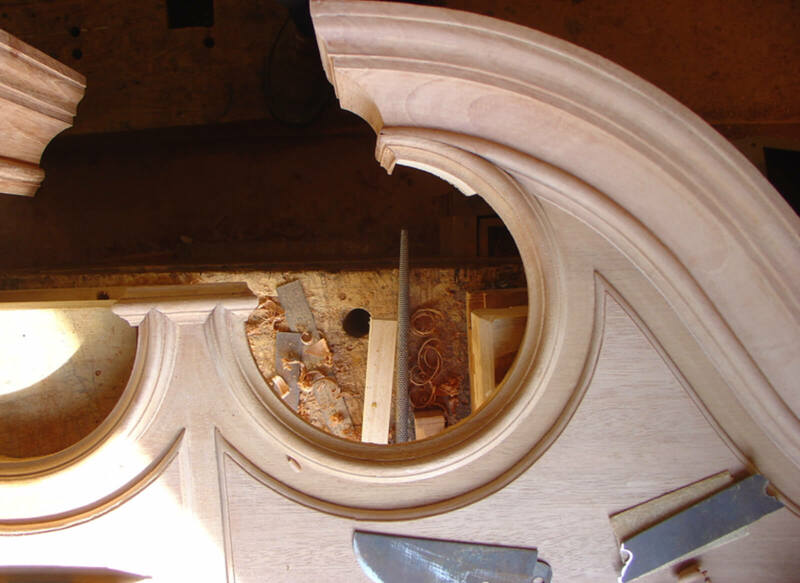 This is where the moldings from each side meet the piece that wraps around the plinth block that supports the center finial. This is a pretty easy set of 45 degree cuts. I do this one last, after the tricky part at the other end is done. 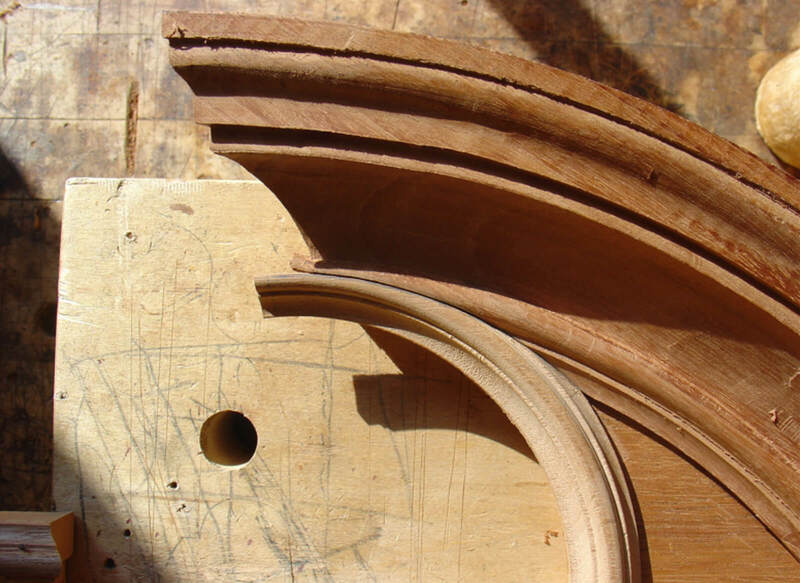 The straight bits of molding are done with hollows and rounds and a scraper so that the same scraper can be used when the moldings are turned on the lathe. 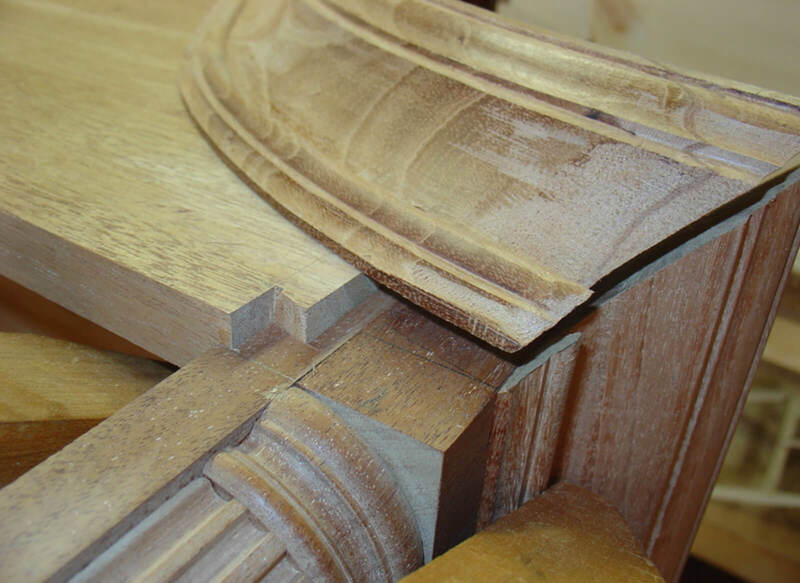 The pediment molding itself is also done with the same scraper since we will be merging it with the turned sections. Here’s the tricky part. 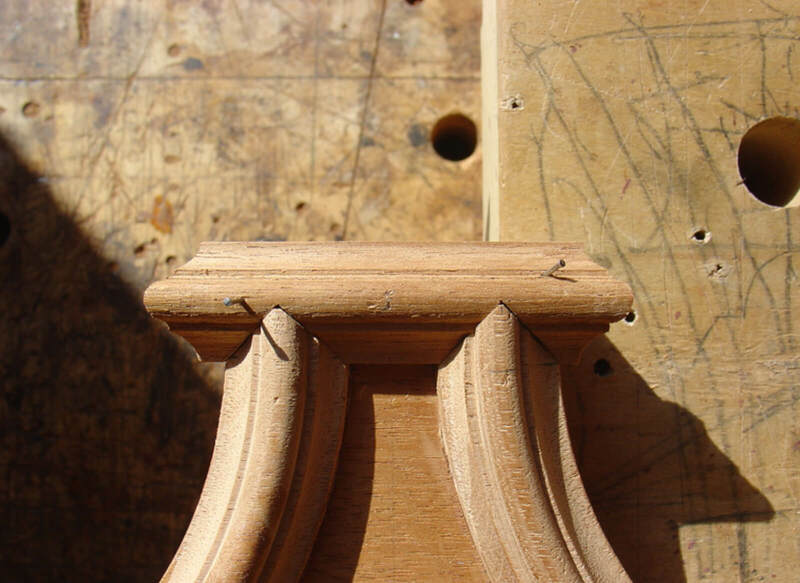 There needs to be a long curved mitre so that the two moldings become one at the termination. How to lay this out? 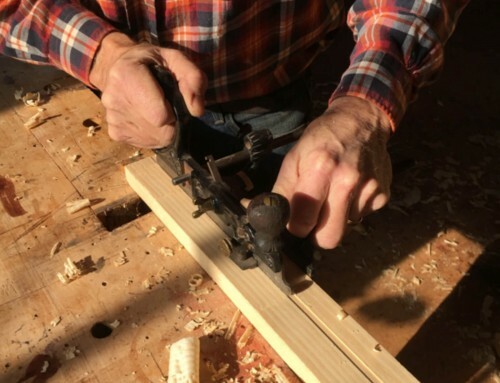 The first time I tried this, I figured that I would cut the turned molding first along a line that I arrived at somehow with a compass. 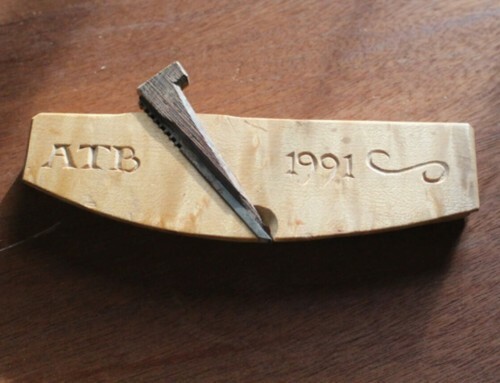 I would then trace it onto the big molding and cut that second. This did not work out well. It seemed that the mitre was not an arc, but some changing curve that I really couldn’t predict accurately. I trimmed and trimmed and used carbon paper and gouges and, in the end, some small shims to fill in gaps. I was not happy. I had inspected period ones and saw both good and terrible joints, so at least I was comforted a bit knowing that they struggled too. I finally settled on a plan. I was pretty confident that I could draw a clean curve by hand- I did it all the time in drawing plans. So I determined where the beginning and the end of the mitre was by holding the moldings on top of each other. I then took a pencil and then a nervous deep breath and drew the curved line that I thought would be the true mitre line of the two moldings. I then cut the mitres and astonishingly found that my line was just about perfect and the joints required almost no trimming. I then fit my center end of the pieces to the plinth molding and added the return piece on the mitred end. The last thing to do on these pediments is set the panels on the pediment board itself and scrape the thumbnail on them using a scraper that indexes off the molding. That way the distance between the molding and the pediment panels is exact. The moral of the story: trust your eye, it’s always the final judge of neat work.